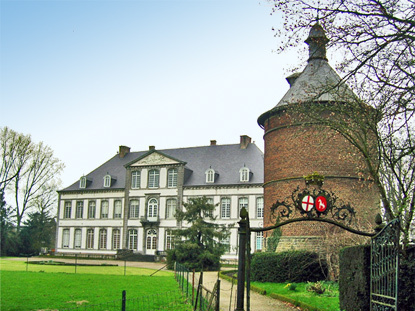 Attre Castle is an exquisite 18th-century Dutch-style edifice, painted in white since 1911. It is located in the north of the province of Hainaut, near the town of Ath. The Normands built a tower in Attre in the 10th century. However, the history of the present castle really starts with an Englishman, Mr. Frenel (or Freneau or Franeau), who purchased the seigneury of Attre in 1520. His descendant, François-Philippe Franeau d'Hyon, count of Gomegnies, dismantled the old castle in 1752, to replace it with the present edifice. His son, François-Ferdinand, private counsellor and chamberlain to Austrain emperor Joseph II, completed the interior. Between 1782 and 1788, the castle receives numerous visits of Maria-Christina of Austria, governor of the Austrian Netherlands, who also happened to be the sister of Joseph II and Queen Marie-Antointte of France. Besides being one of the prettiest castle in the region, Attre charms visitors with its 17 ha fantasy park, with sheep and horses in the fields in one place, craggy tunnels in another, or a bath pavilion along the Dendre yet somewhere else... There is even a wooden chalet (built by a Swiss carpenter) on top of a hill, overlooking an artificial rock that reaches a height of 24 meter. In fact, the 8 years necessary to lay the park cost more to the owners than the construction of the castle itself ! The interior is a witness of the opulence of the rococo style of the period, tactfully conjugated with soberer classical elements. Take note of the rice wallpaper and hand-painted silk from China, and the porcelain from Saxony and nearby Tournai. The staircase has an amazing array of fine portraits. The castle is still inhabited and is only open on Sundays and public holidays, from 2:00 pm to 5:00 pm (to 6:00 pm for the park), between April and October. It is also open on Saturdays in July and August (from 1:00 pm). Visits are only by guided tours. Entry to the castle is 7.50€ for adults, 6.50€ for students, 5.00€ for children (6 to 12). Access to the park alone will set you back 4.50€ or 3.50€ for children. The nearest train station from Attre is Ath (about 20min from Tournai, or 40min from Brussels), 5km away. From there you should take bus 100A toward St-Ghislain, and alight at the church in Attre. The castle is 1min walk from there. By car, take the E429 (Brussels-Tournai) until exit 29 for Lessines, then head toward Ath (5km), then Attre (5 more km). If you are coming from Namur or Mons, take the E42 till exit 23 for Nimy, then follow the N56 for Ath (watch out not to take the N6 for Soignies just after the exit) and look for the signs for Attre (on the right) after about 10km.